Winter Car Tips (not about driving in snow). There are plenty of great tips on how to drive in snow, winter car care, what tires are best in winter weather and what vehicles handle best in inclement weather situations. I would like to discuss the little details that people most often overlook which can make your life a little easier. These tips do not necessarily require you to purchase anything like deicer, a scraper or rain-x or bring blankets/flashlights/water from your home (which are all great ideas) just little tidbits that may make life easier in the wintertime for you and your four wheeled sleigh-wonder. When you are parking your car that you’ve driven through snow, ice, sleet, etc after thawing it out, run your wipers and stop them in the up position on your windshield so that they can move easier when you get back in. Or better yet, put a newspaper, blanket or flattened box under them to keep your windshield free of the sticky cold stuff! Or simply pull them upright off the windshield! A/C On in the Winter Time? What?? Most cars today are programmed to automatically kick on their a/c system when you turn the defrost on, but if you car doesn’t have this luxury, turn on the A/C and defrost for maximum impact. I prefer recycled air for maximum ventilation however fresh air also can work. Can’t Get Up Your Driveway? For those of you with hilly driveways, try putting some paper bags or a bath rug or towel in your car to put under your tires for traction in a slippery situation. Doesn’t cost you anything and can really help gain the extra traction you need to get up the driveway. Our cars these days come glittered with awesome tech features and if you are like most of us we don’t know what half of the features do. SNOW Mode is a cool feature on many luxury cars that actually tapers acceleration to help you on declines or hills and prevent over-revving which can promote under/oversteer and slipping. If you have a “snow mode” button, identify it and use it! Wax on, Wax off…but not for just paint? Yes, that’s right, I said it. Wax your windshield, glass and headlights/tail lights. Why? Easy…snow/ice will come off quicker and be less likely to stick. Additional obvious benefits cosmetically and to keep the car looking more pristine through the winter months. Again keeping with the theme of NOT purchasing anything new on this blog, get out that wax in your garage and give the glass and lights a shine this winter! Real simple, common way to eliminate a little chill in your car could be that big ole’ sunroof shade that’s open. Especially on panoramic roof vehicles (see my blog on that) which cover the entire roof. Close the shade! Might make it a little warmer! With your defrost on, most side vents on cars operate as well and if you are like me your side vents are usually directed towards your face. Don’t forget to point them towards the side windows to aid in the defrost of them! Pop Up Headlights…Where did you all disappear to? Pop Up Headlights…Where did you all disappear to?. How cool were pop up headlights? Sleep aerodynamic front ends of sports cars used to don these hip lights that were powered by motors (originally powered by hand on the first ones) which turned them inside out to illuminate the roads. From Toyotas to Nissans to Ferraris Lambos and Corvettes (most long standing model to use them for nearly 45 years) many if not all of the most desirable cars had them. Now they are all gone. What happened to them? To properly answer this question, we need to take a walk down memory lane. What was the first US car to have this peek-a-boo light option? How about the 1936 Cord? Very cool. What was the last car in the US to have them? 2004 Corvette and the 2004 Lotus Esprit. Why did they go away? Weight, complexity, regulations and safety compliance issues. Cost? Sure all of these things. Now we are stuck with plastic bug-eyes which fade, turn yellow and get tarnished by the sun. Bring back the pop-up lights! Bring them back! Just one car guy’s opinion. Someday perhaps they will return along with gold kits, chrome wheels, louvers and curb feelers! Leo DiCaprio’s Lexus For Sale On eBay … It’s Where Gisele Sat! A guy selling a Lexus on eBay is banking on you paying more because Leo DiCaprio cavorted with Gisele Bundchen and other models in the whip. 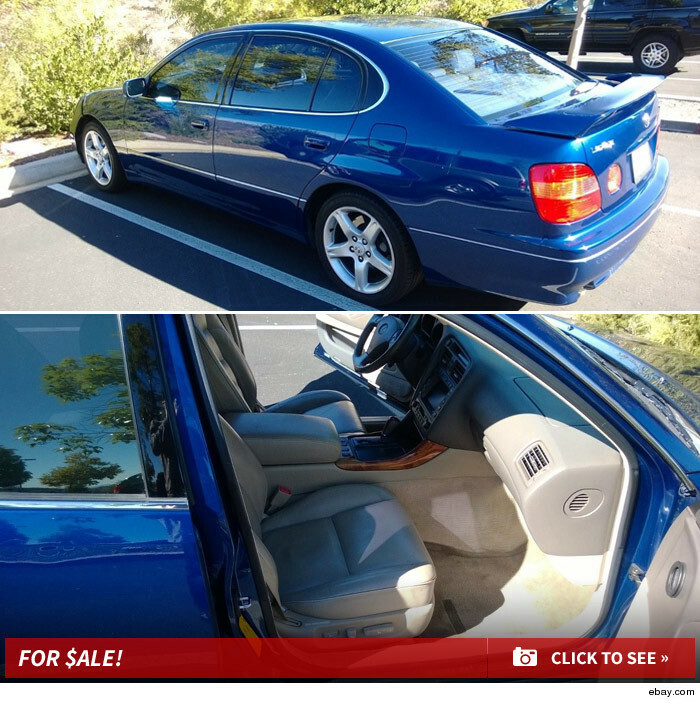 A guy named Brian bought the 1999 Lexus GS 400 at a dealership. The paperwork showed Leo was the prior owner who turned it in after the lease expired. Brian bought the car in 2001 with 18,000 miles. He’s selling it today with 148,091 miles, and you can buy it now for $20,000. So how can he command such a price? top bid so far is $5,000.